Most of the video on this blog has been of Tess doing agility. Well, we have an agility dog in training, too, so I thought I'd post a video of Jazz at agility run-throughs last evening. Jazz had several good runs, including the one in the video below. We had just one mistaken trip up the A-frame (bad handler) and an otherwise great run. Jazz has been coming along nicely, and I'm looking forward to the two of us competing as a team when Jazz reaches 18 months of age. Big sister Tess isn't the only star in the family! Too much fun at agility results in a syndrome known here in our household as "agility hangover." Here's Jazz this morning displaying full-blown symptoms of the dreaded malady! The Greater Pittsburgh Dalmatian Club once again participated in the St. Patrick's Day Parade in Pittsburgh. For those of you who are not familiar, Pittsburgh hosts the second largest St. Patrick's Day Parade in the U.S. Here's the gang from the Dal Club as we get ready for the parade. This year, our nephew Brady joined me, Jim, Tess and Jazz for the parade. A little St. Patrick's Day kiss from Jazz! Tess and Jazz met lots of local Pittsburgh celebrities at the parade. Here we are with the parade's official St. Patrick. Erin Go Bragh! The classic children's television show Mister Rogers' Neighborhood was filmed in Pittsburgh. Tess and Jazz had the opportunity to be photographed with Mr. McFeely, who is a dog lover himself and owns two Mastiffs. Jazz just adored him. "Speedy Delivery"!! Last, but not least, here's Brady and Tess with Punxsutawney Phil, the weather prognosticating star of Groundhog Day. 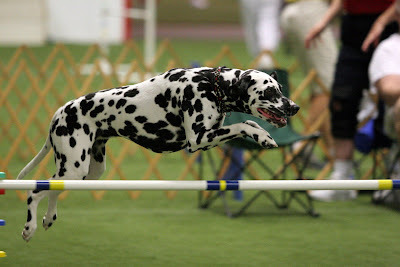 We just received notice that Tess has once again been named one of the Dalmatian Club of America's Top Spots for Agility in 2008! Tess was ranked No. 6 in the country in the Open Jumpers with Weaves class for competition in 2008. We're particularly proud of Tess since these rankings are based solely on AKC agility, and she only competed in that venue a handful of times last year. That's our girl!